Hurray for this historic day when the US Supreme Court made two significant rulings in favor of marriage equality. Overturning California's anti gay marriage Prop 8 and also overturning the national DOMA (Defense of Marriage Act). Significant cultural progress is being made. 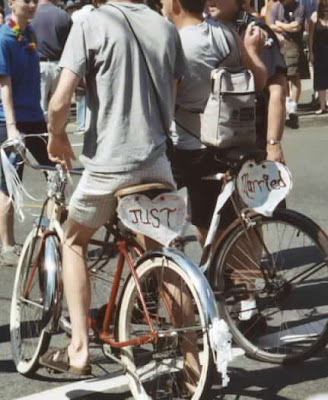 Pictured above are two bicyclists sporting "just" and "married" signs on their bicycles. Image taken in 2003 at the gay pride parade in Vancouver, BC Canada. Canada has been a few steps ahead of USA as gay marriage has been legal for several years in Canada. Hopefully USA will be catching up. In recent years, USA is at what some futurists would call a "tipping point" about the issue of gay rights. A tipping point is when change starts to happen in a certain area quite rapidly. Change happens slowly, but occasionally there are tipping points when things are ready for change to happen rapidly on certain issues. Society evolving into the future. While I don't think I'm the marrying type, myself, I am a strong supporter of marriage equality. This is a historic day.